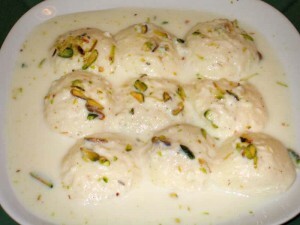 Tasty Rasmalai recipe by Miss M at PakiRecipes.com. Then make about 15 oval shaped or whichever u prefer, from the dough. Making sure they are firm. In a pan (must have a lid), add the milk and the sugar. Keep on very high heat until bubbling. Then add the balls to the milk (Milk must be very hot before adding the balls)Immediately put a tightfitting lid on the pan. Leave for 5 mins before opening again. The balls will have risen and expanded. Turn the heat to very low, and simmer for 2025 mins. Ras Malai with egg?! Eww!!! !